A contact center can only perform well if you take the time to set it up for ongoing success. If you just go through the motions and treat your contact center like an unfortunate and unavoidable expense, you aren’t going to see a good ROI - or happy customers. Fortunately, improving the performance of your contact center doesn’t have to be hard or expensive. 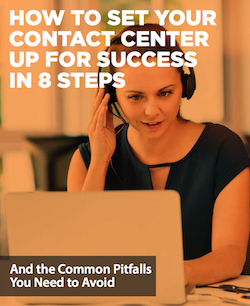 Read our latest guide on How to Set Up Your Contact Center for Success in 8 Steps to learn exactly what to do.